Looking at bonds in a different way: the Laplacian. The title of this post merges those of the two previous ones. The tunable C-Cl bond brought about in the molecule tris(amino)chloromethane by anomeric effects will be probed using the Laplacian of the electronic density. 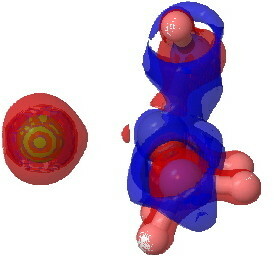 (a) The Laplacian here has a value of -0.67 (= red isosurface), which indicates an accumulation of (covalent) shared density along the C-N bond (underneath this surface, you can see the blue sphere representing depletions from the nitrogen atomic region). 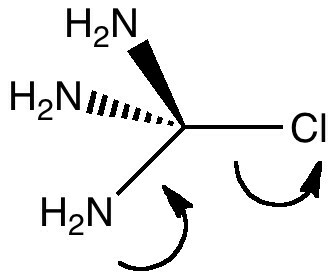 This bond has the lone pair antiperiplanar to a C-N bond. (b) Contrast this with the C-N bond which is antiperiplanar to the C-Cl bond. 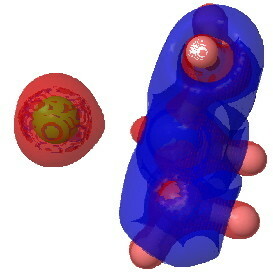 A greater volume of the covalent C-N region is bounded by this isosurface. More of the N lone pair on this atom is donating into the C-N, as more conventionally represented below. Notice how the red isosurface associated with the N lone pair and the region associated with the C-N bond are in fact contiguous, and not separated basins! (c) represents the lone pairs on the chlorine, which have been augmented by the donation from the nitrogen. Notice how they come out as a torus rather than the conventional double dot representations! Notice the absence of any features along the C-Cl bond! This would be typical of a fully or even partially ionic bond, but it also illustrates that with a property such as the Laplacian, one does not get a complete picture by inspecting at just one isosurface value. The next isosurface chosen is 0.3. 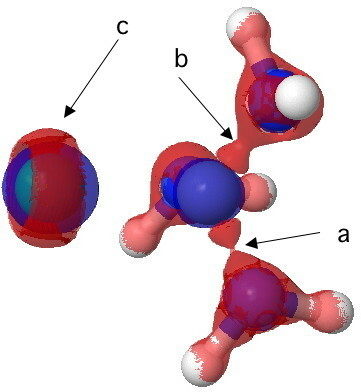 At this lower value, more depletions (blue = electrophilic regions) are seen and a tiny feature now appears along the C-Cl bond, which is the covalent accumulation of that bond, a feature that grows @ 0.2. This nicely illustrates the variable covalency/ionicity of the C-Cl bond. Notice also how the lhs is all red (anionic) and the rhs is mostly blue (cationic), showing the formation of in effect an ion pair. There are many other features which can be explored in these Laplacian maps, but I leave those for the reader to indulge in. Just click on any of the diagrams above,and start your exploration. This entry was posted on Sunday, July 11th, 2010 at 9:31 am and is filed under Interesting chemistry. You can follow any responses to this entry through the RSS 2.0 feed. You can leave a response, or trackback from your own site.